Jonathan T. Capehart (born July 2, 1967) is an American journalist and television personality. He writes for The Washington Post's PostPartisan blog and is a contributor for MSNBC. Capehart grew up in Newark, New Jersey, and attended Saint Benedict's Preparatory School. He is a graduate of Carleton College. Before his work with The Washington Post and MSNBC, Capehart was a researcher for NBC's The Today Show. Subsequently, he worked for the New York Daily News (NYDN), serving as a member of its editorial board from 1993 to 2000. At the time of his hiring, Capehart was youngest-ever member of that newspaper's editorial board. In 2000, he left the NYDN to work at Bloomberg News and afterward, he advised and wrote speeches for Michael Bloomberg during Bloomberg's 2001 run for the mayoralty of New York City. In 2002, he returned to the NYDN, serving as deputy editor of the editorial page until 2004. In December 2004, Capehart joined the global public relations company Hill & Knowlton as a Senior Vice President and senior counselor of public affairs. He joined the staff of The Washington Post as a journalist and editorial board member in 2007. He currently serves in that capacity, in addition to being a contributing commentator for MSNBC. In 2018, Capehart began guest hosting the WNYC radio show Midday on WNYC (formerly The Leonard Lopate Show). Capehart was a key contributor to a New York Daily News editorial team that won a Pulitzer Prize in 1999 for Best Editorial Writing. The award was for a series of editorials regarding Harlem's Apollo Theater. He was a 2011 Esteem Honoree, a distinction given to individuals in recognition of efforts in supporting the African American and LGBT communities in the areas of entertainment, media, civil rights, business, and art. In February 2016, Capehart published a false accusation against presidential candidate Bernie Sanders, alleging that the Sanders campaign had been misrepresenting a photograph showing Sanders speaking at a civil rights sit-in in the 1960s. Capehart wrote that the Sanders campaign should "stop physically placing him where he existed only in spirit," arguing that the photo showed another activist, Bruce Rappaport. The photographer/documentarian of the event, Danny Lyon, refuted this claim and revealed other photos of Sanders from the sit-in, which are not in dispute and show Sanders wearing identical clothing and eyeglasses. Many people expressed frustration with Capehart, accusing him of staging a "smear" of Sanders. Capehart never recanted his accusation, instead writing a follow-up article titled, "Bernie Sanders and the Clash of Memory." In the article, Capehart juxtaposed Lyon's testimony and photographic evidence with testimony from Rappaport's friend Bruce Stark, who is pictured in the photo, and from Randy Ross, who wasn't at the event but was married to Rappaport for 5 years. In May 2016, Capehart became engaged to his boyfriend of over five years Nick Schmit, assistant chief of protocol at the State Department. 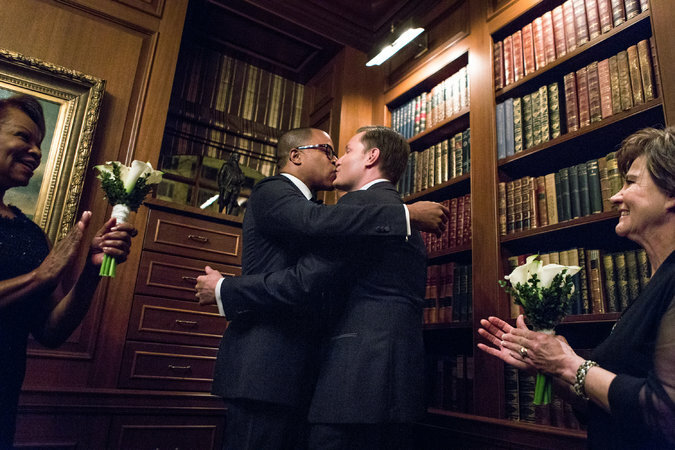 On January 7, 2017, Capehart and Schmit were married by former U.S. attorney general, Eric Holder. ^ "Happy Birthday Mr. Capehart". MSNBC. ^ "Carleton College". Media Relations. ^ "Jonathan Capehart: Opinion Writer". The Washington Post. Retrieved April 4, 2012. ^ Seiden, Jane. "Jonathan Capehart Will Speak at the Newark Public Library", Newark Patch, January 22, 2016. Accessed February 8, 2016. "Mr. Capehart, a Washington Post editorial board member, PostPartisan blogger, and MSNBC contributor, was born and raised in Newark and graduated from St. Benedict’s Preparatory School." ^ a b c d e "Profile: H&K's Capehart climbs ladder with help from friends". PR Week via HighBeam Research (subscription required). July 18, 2005. Archived from the original on May 11, 2013. Retrieved April 25, 2012. ^ "Alumni Pages:Capehart, Jonathan. Class of 1990". Carleton College. Archived from the original on April 15, 2012. Retrieved April 4, 2012. ^ a b "Click:Jonathan Capehart". Politico. 2012. Retrieved April 25, 2012. ^ a b "Jonathan Capehart". David Patrick Columbia's New York Social Diary. Retrieved April 5, 2012. ^ a b Bugg, Sean (November 4, 2010). "Man in the Middle:Jonathan Capehart charts his own course as one of Washington's leading opinion-makers". Metro Weekly. Retrieved April 4, 2012. ^ Gordon, Meryl (November 19, 2001). "The Winner's Circle". New York. Retrieved April 4, 2012. ^ "Jonathan Capehart". Center for American Progress. June 2010. Archived from the original on 2012-07-17. Retrieved April 4, 2012. ^ a b "2011 Honorees". The Esteem Awards. Archived from the original on March 5, 2012. Retrieved April 6, 2012. This page was last edited on 16 February 2019, at 16:55 (UTC).